A ground-level reimagining of the violent protests at the 1999 World Trade Organization meeting in Seattle, told from a host of perspectives. By following the attenuation of moral responsibility that political leaders depend on, Yapa demonstrates the grotesque process that encourages otherwise good, reasonable people to perfect methods of maiming and blinding peaceful protesters. ...the novel’s indisputably good heart is weakened by a tendency toward overwriting and the conventionality of its narrative moves ... Yapa’s instinct is to dramatize the answers, to create around them a machinery of narrative buildup — back story, slow reveal, pathos and suspense — that seems too streamlined for the mass of human contradiction on which it’s built. You have to give Yapa credit for his ambition, and it's obvious that he's a writer of great compassion. The concept behind Your Heart Is a Muscle the Size of a Fist is a good one, but the execution is, at best, amateurish. 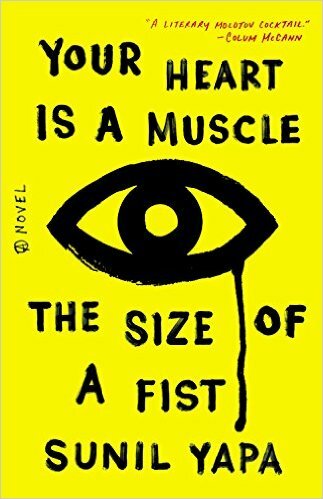 What did you think of Your Heart Is a Muscle the Size of a Fist?